Mortem Vetus are very proud to present Immortalis, a quirky prop set in our own distinctive style. Included in this set is a Casket, a Mummy and five Canopic Jars. 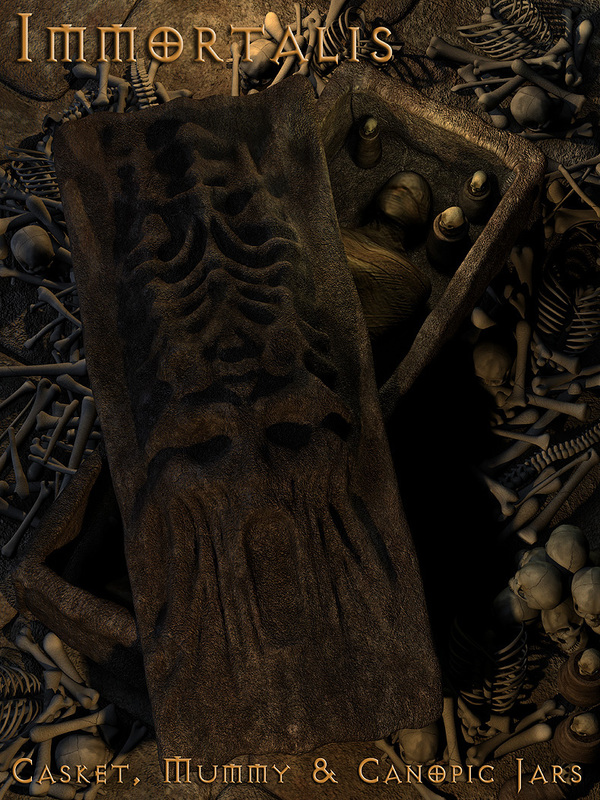 There are also 6 texture sets to choose from for the Casket and the Casket Lid, as well as three texture options for the Mummy. We've also included 14 poses for the Lid of the casket, for quick and easy positioning. This set comes with a html User Guide to give you an overview of the product. *Please Note* The materials in this set are texture based, so should translate into D|S. Please be aware that we do not support D|S as we do not use it.